It’s that time of year again when the senior design projects come rolling in. [Ben], along with his partners [Cameron], [Carlton] and [Chris] have been working on something very ambitious since September: a robotic arm and hand controlled by a Kinect that copies the user’s movements. The arm is a Lynxmotion AL5D, but instead of the included software suite the guys rolled their own means of controlling this arm with the help of an Arduino. The Kinect captures the user’s arm position and turns that into data for the arm’s servos. A Kinect’s resolution is limited, of course, so for everything beyond the wrist, the team turned to another technology – flex resistors. A glove combined with these flex resistors and an accelerometer provides all the data of the position of the hand and fingers in space. This data is sent over to another Arduino on the build for orienting the wrist and fingers of the robotic arm. As shown in the videos below, the arm performs remarkably well, just like the best Waldos you’ve ever seen. Check out the game of chess going on above. It’s a virtual game where each player uses a glove as the controller. Or course the game board and pieces are missing from this image. They’re displayed on a computer monitor which both players can see. The hardware rather simple, and we think it would be a great project to challenge your microcontroller skills. Each glove has an accelerometer attached to it, as well as a ring of copper foil on the pointer finger and thumb. One ATmega1284 monitors both gloves. The accelerometer data is used to move the mouse cursor on the screen, while the contacts are used to grip or release a playing piece. The game board and pieces are displayed using MATLAB with controller commands fed to it via a USB connection. If you’re more into building a mechanized game check out this pair of telepresence chess boards. Jump scares are a lot of fun, but if you want to hold the attention of all those trick-or-treaters we’d suggest a creepy prop. One of the best choices in that category is a ghoulishly lifelike hand. 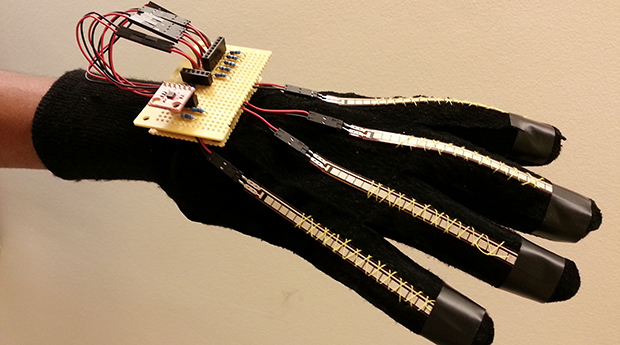 You can draw some inspiration from this roundup of robot hands which Adafruit put together. We’ve chosen four examples for the image above but there are more to be had than just these. In the upper left there is a laser-cut acrylic hand that actually features some force sensitive resistors on the fingertips to help implement some haptic feedback. This project was inspired by the hand seen in the lower right which uses flex sensors on a glove to control the bot’s movement. If you’re looking for something more realistic the 3D printed parts on the lower left are the best bet. But if you’re looking to put something together by Halloween night the offering in the upper right is the way to go. It’s hacked together using cardboard templates to cut out plastic parts and using polymorph to form joints and brackets.